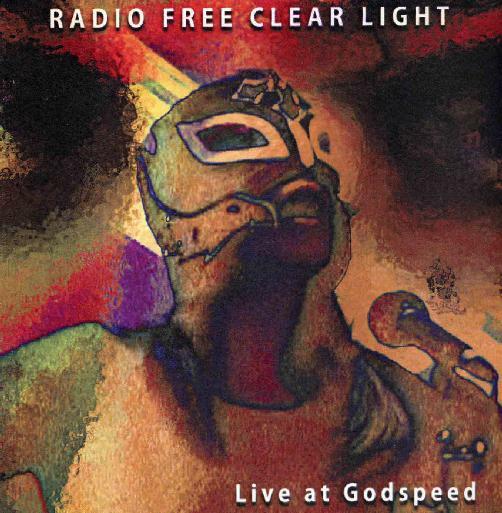 Radio Free Clear Light is JC Mendizabel (aka Kyron) and Live at Godspeed was recorded during a ritual performance in Oakland California in July 2007. TRACK ONE: Interesting and spacey repeated riff. At the end the piece picks up the tempo with live drumming and sounds pretty damn great! The songs go from one to the next with no break! TRACK TWO: Yup, some badass drumming by Jim Sienkiewicz with intense space noise backdrop of Lydia Harris, Etanna Zak and Kyron. At around 3:30 some fearsome female vocal moaning. the music gets very moody and ambient! "Captured for you on this 50 minute disc is the dungeon like atmosphere of Godspeed transformed by the demented beauty that lived there for one night, before slipping away into the dark in search of a new host." At 7:35 some intense cymbal crashes. I've reviewed a couple of Kyron's previous releases and gave him not so good reviews but I have to admit this is pretty badass, I'm impressed! TRACK THREE (10:29): Industrial drum hypnobeat! Then comes various accompaniment, then some bass! Yes, it's very Krautrock! TACK FOUR keeps going nonstop thru all the songs! Another variation on the Krautrock theme of rock drumming with experimental backdrop! Gets a little samey but still good! TRACK FIVE: Back to the ambient female vocal. Yes, it's very nice! I bet this was a cool show to attend! TRACK SIX: A pre-recorded vocal loop of "the nation worships demons," more drum beat experimental space rock! Finally starting to sound a little old hat, 80's retro sounding but still interesting! Some nice synth riffage! TRACK SEVEN (11:30): Funky deep end bass riff along with female wailing. Yup, it's cool! Almost too slick for experimental music, more like dance music! Very nice pristine sound, especially for live! At around 6:40 the drums stop and it changes moods into more reflective, to me more interesting music! Nice space drone with female vocals!